Several studies demonstrate that lenalidomide (LEN) maintenance post autologous stem cell transplant (ASCT) reduces the risk of disease progression or death in patients with multiple myeloma (MM) by approximately 50% (Attal, NEJM, 2012; McCarthy, NEJM, 2012; Palumbo, NEJM, 2014). 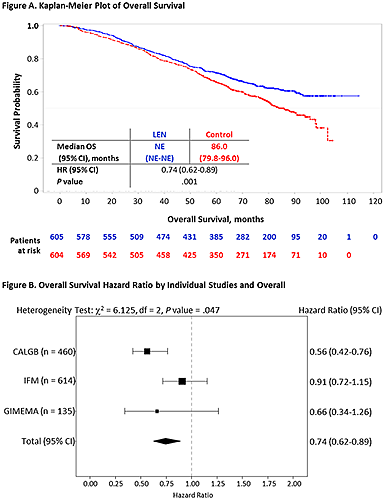 However, these studies were not powered for overall survival (OS). To conduct a meta-analysis assessing the effect of LEN maintenance post ASCT on OS. (hazard ratio [HR] = 0.78). From 2005 to 2009, 1209 patients were randomized in the 3 RCTs to receive LEN (n = 605) 10 mg/day on days 1-21 (GIMEMA) or 1-28 (IFM and CALGB) of 28-day cycles or control (n = 604). With a median follow-up of 6.6 years, 491 patients (41%) had died. Baseline characteristics were generally balanced in the pooled data. After induction and single (82%) or tandem (18%) ASCT, 55% of patients achieved a complete response (CR) or very good partial response (VGPR). Median OS for the LEN maintenance group was not reached compared with 86 months for the control group (HR = 0.74; 95% CI, 0.62-0.89; log-rank P =.001; Figure A), and 5-, 6-, and 7-year OS were longer in the LEN maintenance vs the control group (71% vs 66%, 65% vs 58%, and 62% vs 50%, respectively). Fisher’s combination test confirmed the significant OS benefit in the meta-analysis (P = .001). Patients who achieved ≤ PR post ASCT benefited from LEN maintenance (HR = 0.86; 95% CI, 0.65-1.15) as did patients with CR/VGPR (HR = 0.70; 95% CI, 0.54-0.90). OS benefit was generally consistent across subgroups. Based on a heterogeneity test (Pignon, Lancet Oncol, 2001), the OS study results from the efficacy meta-analysis were considered significantly heterogeneous (P = .047; Figure B) across studies for both the intention-to-treat post-ASCT population and for all patients randomized. Potential factors contributing to the heterogeneity between the clinical trials were explored and identified, including baseline/disease characteristics (such as International Staging System stage, cytogenetics), study conduct, and second-line therapy. Second primary malignancy data will be presented. This large meta-analysis demonstrates that LEN maintenance significantly prolonged OS vs control (placebo/no maintenance) post ASCT, including in patients who achieved CR, demonstrating benefit in patients in all response categories.